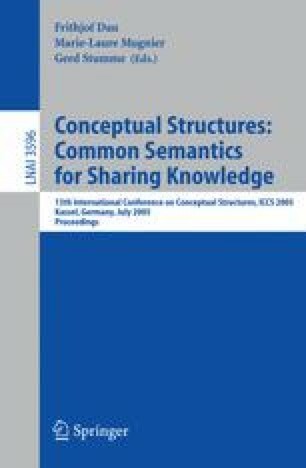 Ontologies, taxonomies, and other semantic hierarchies are increasingly necessary for organizing large quantities of data. We continue our development of knowledge discovery techniques based on combinatorial algorithms rooted in order theory by aiming to supplement the pseudo-distances previously developed as structural measures of vertical height in poset-based ontologies with quantitative measures of vertical distance based on additional statistical information. In this way, we seek to accommodate weighting of different portions of the underlying ontology according to this external information source. We also wish to improve on the deficiencies of existing such measures, in particular Resnik’s measure of semantic similarity in lexical databases such as Wordnet. We begin by recalling and developing some basic concepts for ordered data objects, including our pseudo-distances and the operation of probability distributions as weights on posets. We then discuss and critique Resnik’s measure before introducing our own sense of links weights and weighted normalized pseudo-distances among comparable nodes.